Cook this stuffing in a casserole dish covered for the first 30 minutes and uncovered for the last 15 so it browns a bit on the outside. Saute onions, celery and carrots in a tablespoon of olive oil. 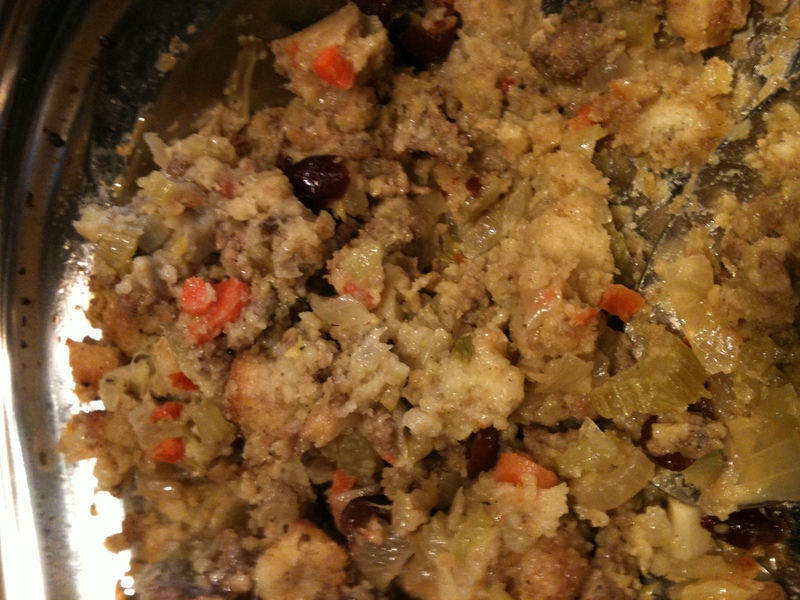 Add chicken broth, then add cornbread stuffing mix. Add the cooked and drained sausage (Jimmy Dean’s sage sausage and 6 hot Italian Sausages) and cranraisins. 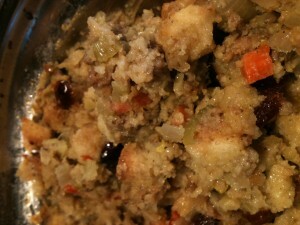 Depending upon the moisture level, add the regular bread stuffing until the dressing is damp and moist but not runny. Place in a buffet pan, or casserole dish. Cook for 45 minutes at 350 degrees. This entry was posted in Side Dishes, Thanksgiving and tagged Stuffing. Bookmark the permalink.